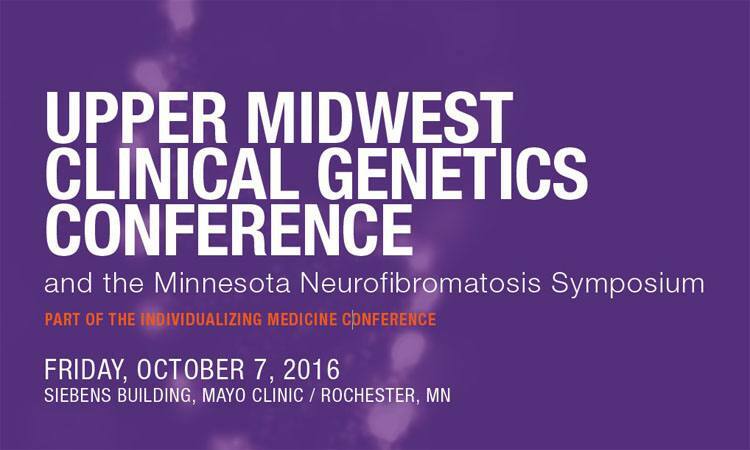 The fifth annual Upper Midwest Clinical Genetics Conference and the Minnesota Neurofibromatosis Symposium will be held October 7, 2016, in Rochester, Minnesota. This is an opportunity to build on the understanding of the current research related to the diagnosis and management of genetic diseases, and a chance to network and share clinical research with colleagues. The Upper Midwest Clinical Genetics Conference provides genetics professionals with the opportunity to learn how genetics and genomics are being integrated into medical or clinical practice. The day-long meeting has integrated a high caliber scientific program that will present the latest developments and research in clinical genetics with a collegial atmosphere perfect for networking and sharing of information. The conference is also looking for speakers to present their genetic research in the plenary session. The plenary presentations are an integral part of the Upper Midwest Clinical Genetics conference. The review committee is looking for the best and brightest research in clinical genetics. Key to this year’s speaker selection is the innovative use of research, and also how each speaker plans to outline the research’s application into practice. The deadline for abstract submission is July 31, 2016. 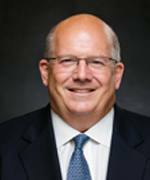 Minnesota Neurofibromatosis Symposium is the results of a research collaboration between Mayo Clinic, Children’s Tumor Foundation, Children’s Hospitals and Clinics of Minnesota, and the University of Minnesota. Each year they come together for an educational opportunity to provide information about advances in neurofibromatosis research and offer practical advice on issues facing patients and families living with the disorder. Neurofibromatosis is a set of complex genetic disorders that affects almost every organ system, causing tumors to grow on nerves in the brain and throughout the body. While half of all affected people inherit the disorder, new cases can arise spontaneously through mutations in the neurofibromatosis genes. The Center for Individualized Medicine will be hosting a reception Thursday night, October 6, prior to the conference. 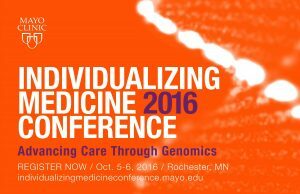 The Upper Midwest Clinical Genetics Conference and the Minnesota Neurofibromatosis Symposium is part of the Individualizing Medicine Conference 2016: Advancing Care Through Genomics. 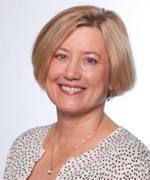 The Individualizing Medicine Conference runs October 5–6, in Rochester, and focuses on how to translate the promise of genomic medicine to your practice. Expert speakers, focused breakout sessions, case studies and a poster session provide opportunities to discover and discuss emerging topics in applied genomics. Discounts are available to attendees who attend both conferences. To register for Individualizing Medicine Conference 2016, and/or the Upper Midwest Clinical Genetics Conference and the Minnesota Neurofibromatosis Symposium, please visit the conference registration page.